Been there, done that, bought the t-shirt… as the saying goes. Well, if you did, good on you. 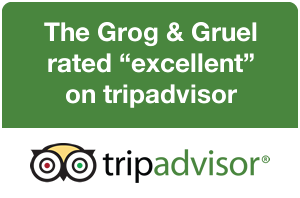 If you didn’t here’s another chance to buy one of our highly fashionable, incredibly priced, highly prized Grog & Gruel t-shirt, plus a few other tasteful and very reasonably priced souvenirs. Our distinctive t-shirt has been a top seller since we opened in 1994. It’s a super premium quality shirt in heather grey and sports our logo on the reverse. The front carries a discreet address tag on the left breast. UK first class postage is £2.70 for one shirt. 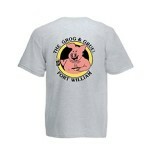 Sizes available are generally S, M, L, XL and occasionally XXL. Buy your shirt now using Paypal for UK addresses only. For overseas addresses and multiple purchases please ask for a quote first. 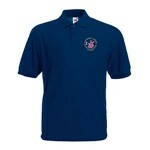 Stylish and understated, our heavyweight navy polo shirt carries our Horace the Hog logo embroidered on the left breast. The boss likes ’em and that’s good enough for us. UK first class postage £2.70 for one shirt. Sizes: S, M, L, XL (all in navy blue). 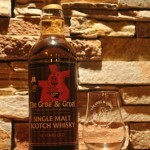 The perfect gift for the Grog & Gruel fan in your life! 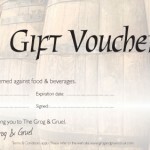 Redeemable against food and drinks at The Grog & Gruel, in £25 denominations. 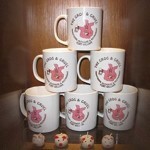 Ideal for birthdays and Christmas gifts! Can be redeemed against food and/or drinks. No change given against gift vouchers. 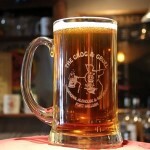 Our versatile coffee mugs are a lasting reminder of your favourite Traditional Alehouse and Restaurant. Versatile? Yes, they can be used for tea or even hot chocolate as well. 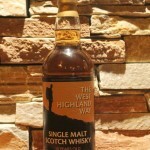 You can’t appreciate a good malt whisky in just any old glass. 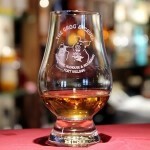 This glass has the optimal design for both nosing and tasting the water of life, and it also has that essential ingredient – The Grog & Gruel logo. Doubtful that sailors of old drank their grog from anything like this, but ideal for enjoying that bottle of beer from the fridge in the comfort of your own home. Comes complete with The Grog & Gruel logo to remind you of where you’d rather be enjoying your beer. 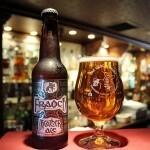 (bottle of Heather Ale not included!). P&P in Europe is £3.86 or £6.07 world wide. You need to confirm that you over the age of 18 years before we can sell this product to you. Drink responsibly. We can only post to UK addresses.